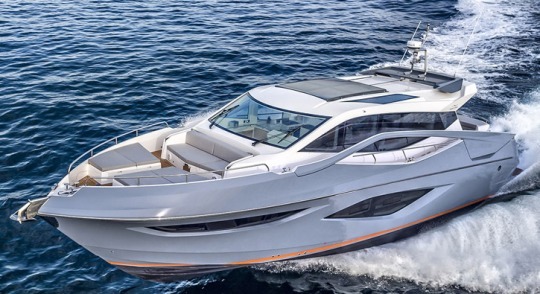 Numarine continue to expand there line with the new 62 Hardtop, called as project 60 in design construction stage. A different aggressive looking nineteen meter sport yacht, with the new 62 Hardtop designer Can Yalman brings the looks he proposed with the Numarine 70 a few years back in a smaller size. The stand out feature of Can Yalman Numarine design is the attacking like looks, but also the different fore-deck with two side sun-pads and the forward looking bench settee. Just as the 60/62 Flybridge launched in the first part of 2016, the 62 Hardtop offers a spacious three double cabins interior layout, with full beam owners stateroom and all served with a private en-suite shower head. A twin crew cabin is located aft. Living is all on the main deck with a central positioned galley being center to a traditional layout, which can join form and function with the aft cockpit deck dinette. Power for the Numarine is for standard Volvo 725hp with IPS pod drives with an optional choice for twin Volvo 900hp engines.